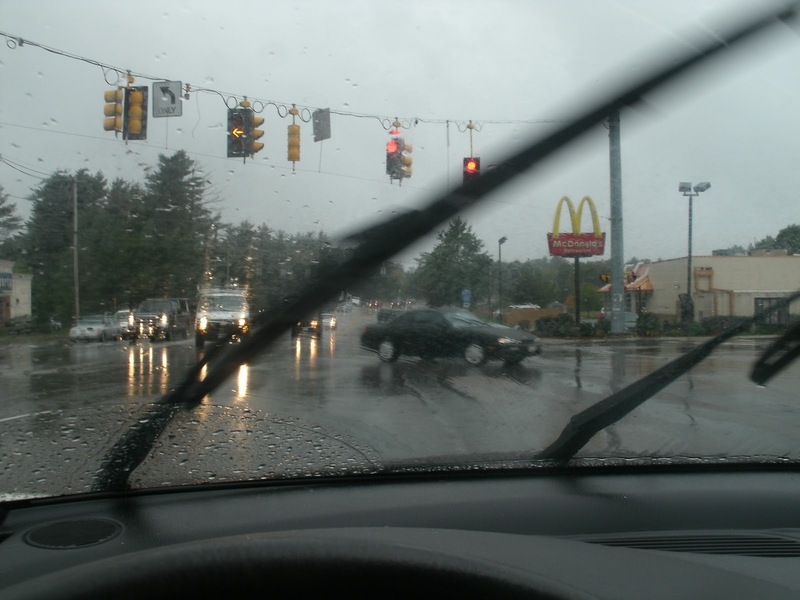 The top on the convertible was definitely UP this day as the remnants of Tropical Storm Nicole dumped rain and wind on the Greater Boston area. 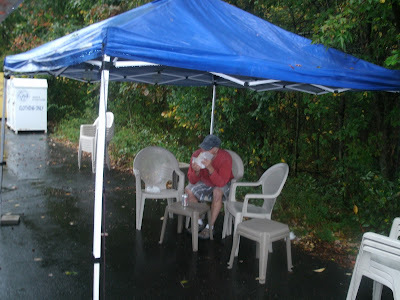 I was not optimistic about finding a good, outdoor hot dog. 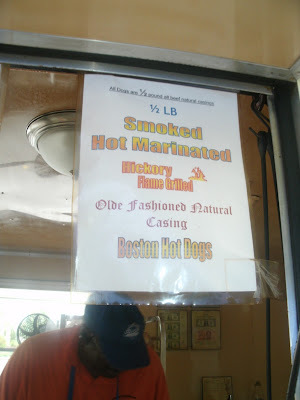 Hot Dog Mary told me about a place in the parking lot of Larry’s Package Store (that’s a liquor store to you non Bostonian readers) at 246 North Main Street (route 126) in Bellingham, MA when Little Miss and I went to visit her last month. My faith in hot dog humanity was restored on this miserable day when I saw that gleaming beacon of roadside hot dog lovers everywhere: the “OPEN” flag. 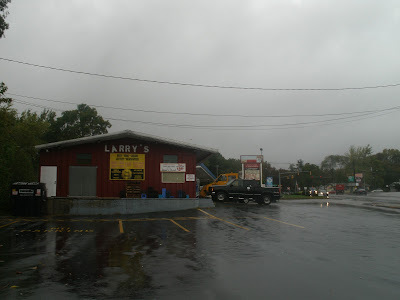 I had come out on this crappy day to find Larry Joe’s New England Fire Pit, and, despite the rain, it was Mission Accomplished! 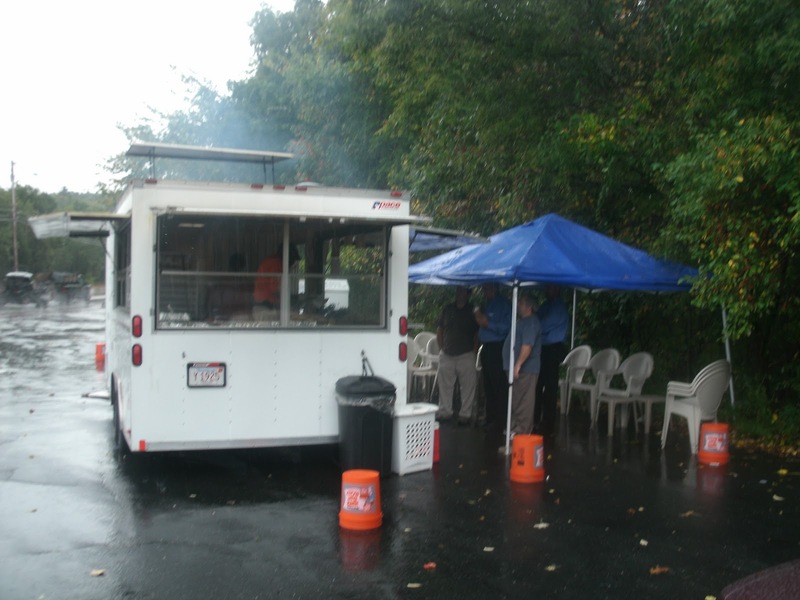 Even in a steady downpour, the Fire Pit was smoking and there was a line full of hungry hot dog lovers. 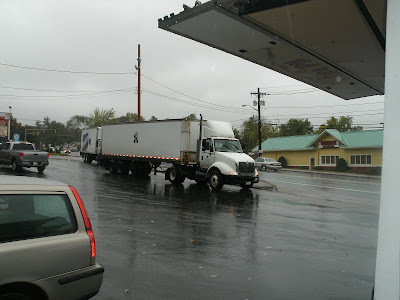 It meets my criteria for a good location: a busy road, high visibility and plenty of parking- even for the big rigs. Larry Joe’s New England Fire Pit is owned and operated by Larry Joe. His wife, Beverly Joe, was lending a hand today, but she was camera shy. Sometimes his son, Andrew, helps out on weekends; at least when the 6’3″, 235 pound defensive end isn’t injecting fear and punishment into opponents of the Millis-Hopedale Blue Raiders Football team. Larry’s a relative newcomer to the hot dog scene- he’s been in his spot for around three and a half years. This location has seen its share of local hot dog lore- it’s the former home of the now defunct Hottie Dogs. A few years ago a couple of local moms opened a hot dog joint here; apparently they didn’t relish the experience, couldn’t cut the mustard, and closed up shop. But I digress…..
Larry and his family live in nearby Hopedale-about ten minutes from his spot. For over twenty years Larry worked as a Nuclear Management Engineer for Stone and Webster and his work kept him traveling all over the country, all the time. 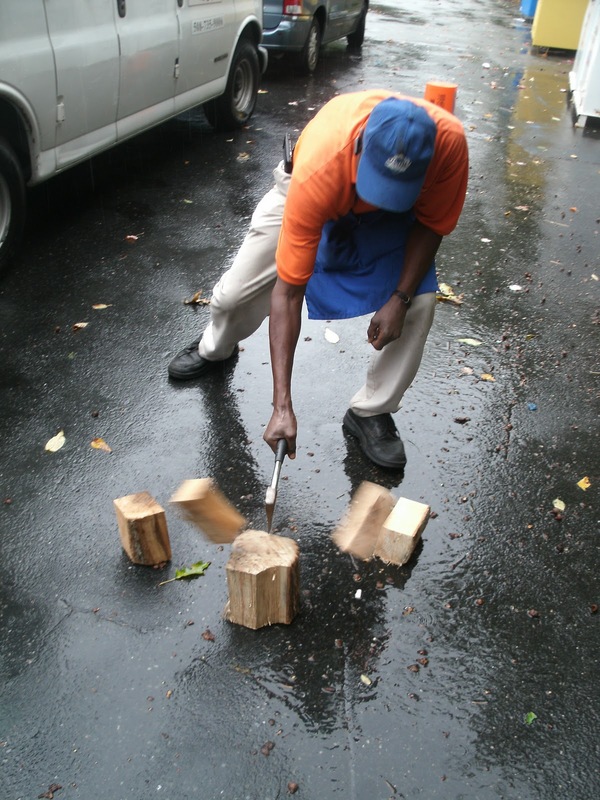 He wanted to get into a business of his own that didn’t require him going far from home. 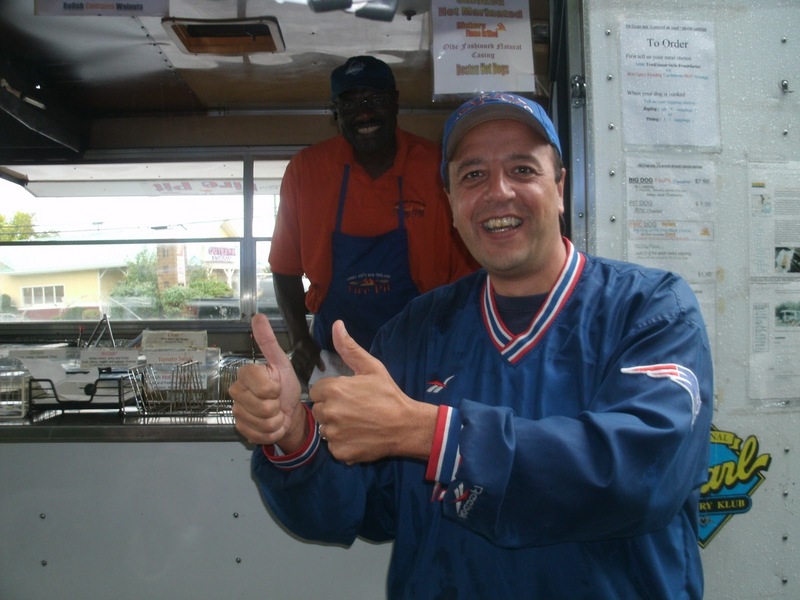 His analytical skills led him to develop a business plan for a hot dog stand. 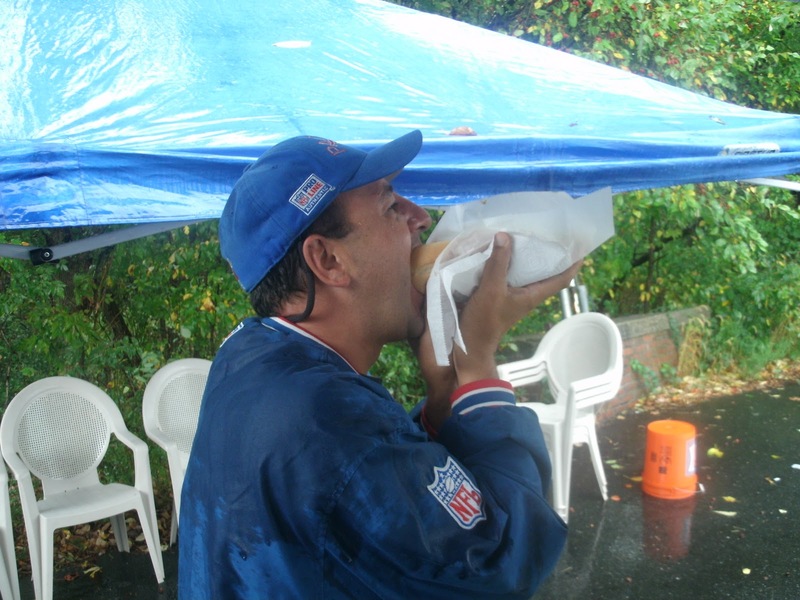 Through meticulous research, Larry realized the hot dog business could be both enjoyable and profitable. 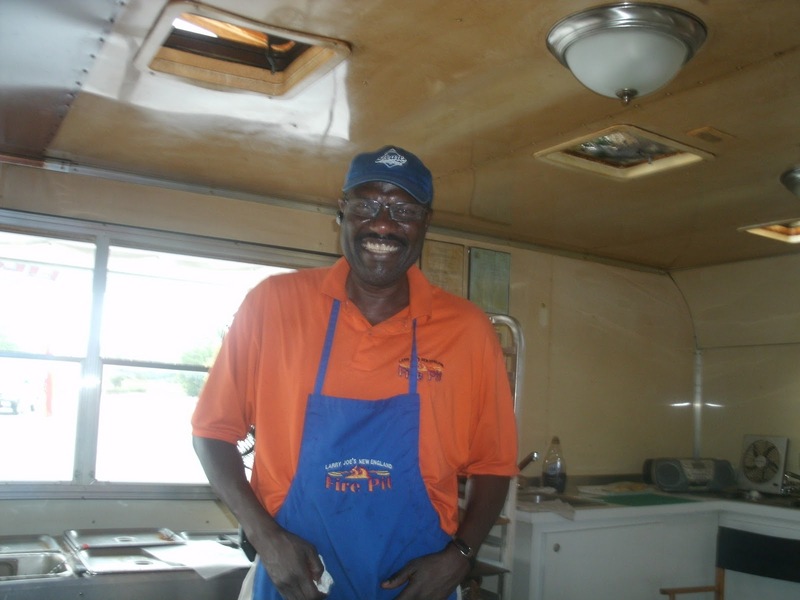 He’s developed software to evaluate profitability and cash flow and he let fellow hotdogman and friend Doug Burrell, of Big Daddy Hot Dogs, use his software (hotdogmen need to stick together ya know). Boston Speed is a legend in these parts. Larry and Speed attend the same church and Speed let him work alongside him for the 2005-2006 seasons to learn all the tricks of the trade. Larry even managed to procure several of Speed’s secret recipes. 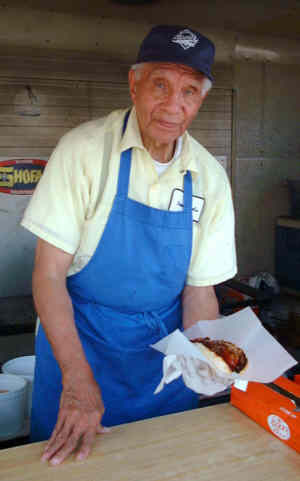 Speed, now 90, is retired; he sold his business which is still operating as The Boston Speed Dog. 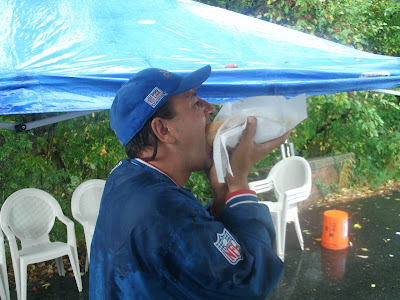 The new owner changed the brand of hot dog, so Larry claims he’s carrying on Speed’s tradition. Larry Joe’s New England Fire Pit is open Tuesday-Saturday, 11AM-7PM; he closes early on Fridays to go see his aforementioned son, Andrew, run amok over opposing offenses. 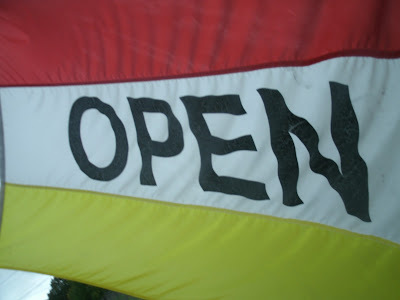 He plans to stay open all winter (he did last year) and only closes if two out of the following three things happen at once: less than 10 degrees, precipitation, wind over 20 MPH. He runs his business out of a custom built Pace American trailer he purchased new. 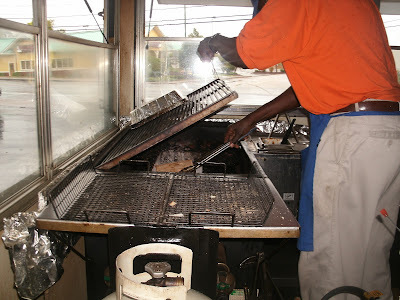 There’s a huge charcoal grill, 8 bay steam table, refrigeration, sinks and storage. It’s a quality rig built to cook Larry’s way. He tows the trailer home every night and takes it to the occasional event- he’s working the Hopedale Octoberfest alongside Hot Dog Mary (it will be over by publication date). My apologies for the picture quality today-the rain was wreaking havoc with my camera. Larry walked me through the whole process of cooking/smoking his dogs. 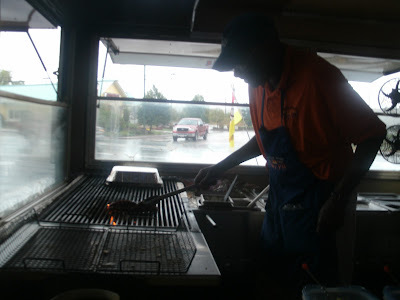 He’s from Arkansas originally and, down South, they like Hickory Smoke on the barbecue. Larry hand cuts his hickory wood…. ….and drops it into the coals of his grill to give the hot dogs a hickory smoked flavor. 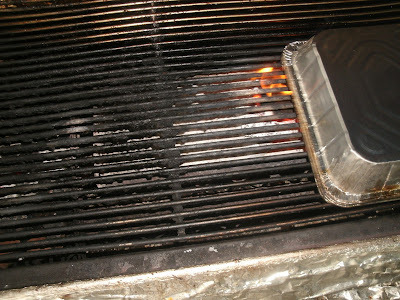 Once the coals are good and hot, Larry takes a half pound, natural casing hot dog that’s been marinating in Speed’s “secret sauce” and grills it until it bursts. While the dog is cooking, Larry bastes it continuously. 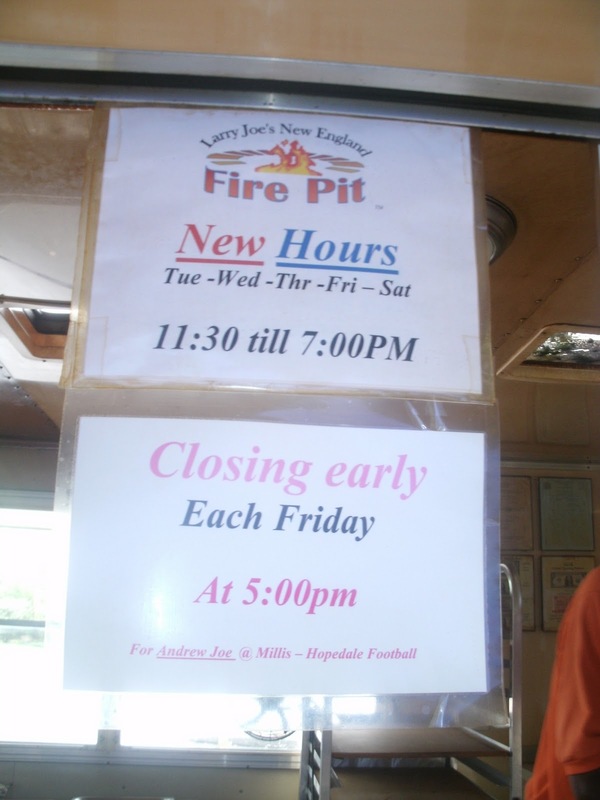 There are three options for hot dogs at Larry Joe’s new England Fire Pit: the Pit Dog and the Big Dog are half pound Pearl Hot Dogs and the Fire Dog, which is also a half a pounder made by Pearl. 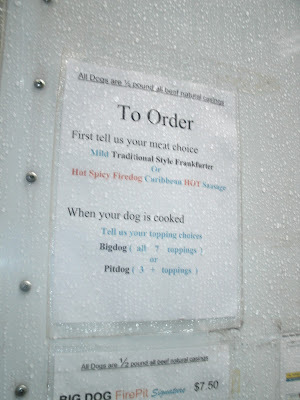 The special thing about the Fire Dog is it’s loaded with Caribbean style spices. 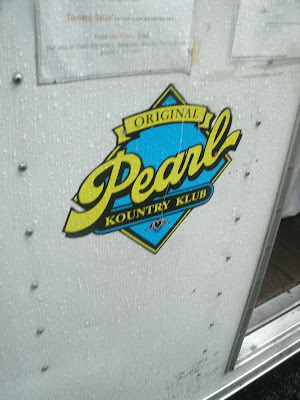 Pearl sells a lot of these dogs down south, but to Larry’s knowledge, he’s the only one who serves these dogs in the northeast. Larry offered me a taste a la Baskin Robbins. It was delicious, but a bit too spicy for The Hotdogman‘s delicate constitution. 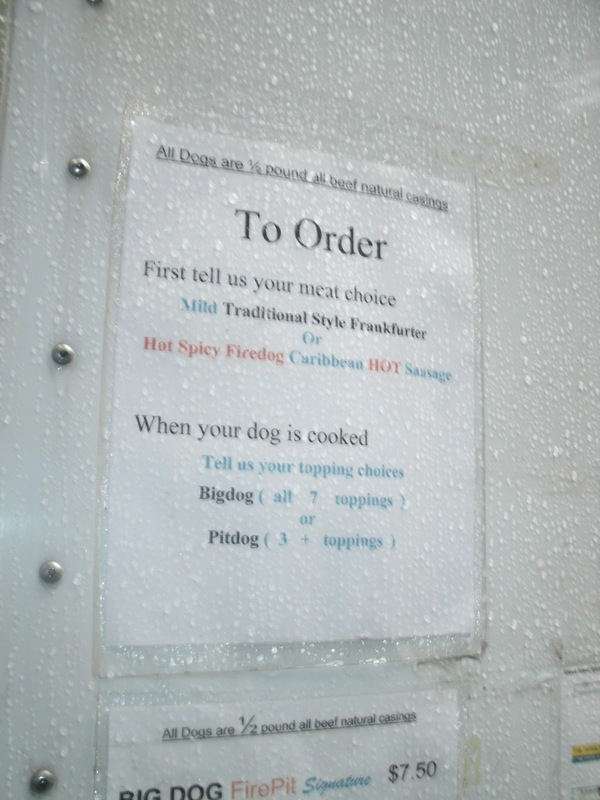 I went for a Big Dog which has all 7 of Larry’s toppings: Mustard, Barbecue Sauce, Onions, Spicy Berry and Walnut Chutney Relish, Chili, Tomato Salsa, and Hot Pepper Relish (OK I skipped the pepper relish too). 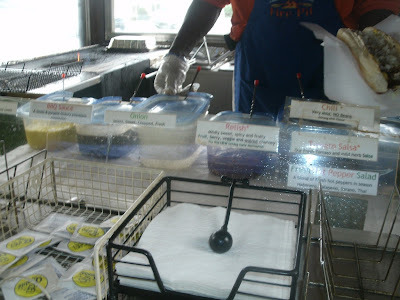 All the toppings are homemade daily by Larry himself. 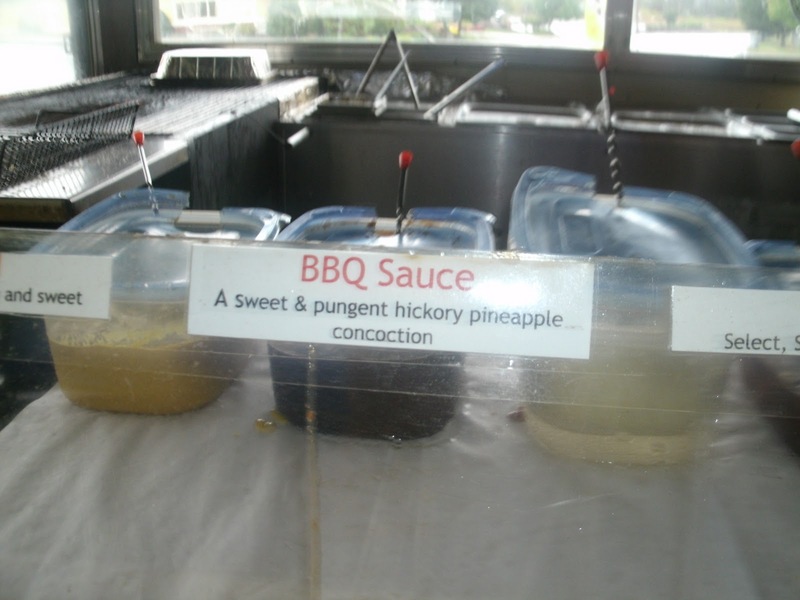 “Ketchup has tomatoes, onions, high fructose corn syrup, vinegar, salt, and assorted spices. Take away the vinegar and the salt, because we aren’t trying to preserve anything, and the high fructose corn syrup and I have all those ingredients right here in my fresh tomato salsa.” He claims to have a one hundred percent conversion rate from ketchup to his salsa- then again, he doesn’t offer them the choice! He says when ketchup heiress Theresa Heinz serves ketchup on her private jet, he’ll serve it at his trailer. Classic stuff, Larry, classic stuff. THIS is the finished product. Look at that hot dog! It’s a good thing Little Miss is in school today, this dog is bigger than her head (and I always instruct my kids never to eat anything bigger than their head). Lucky for me, I have a big, fat head, I was looking forward to this dog! Here’s Larry dressing it up for me (the finished picture didn’t come out due to a large drop of water on the camera lens). I checked out the dining room and…. 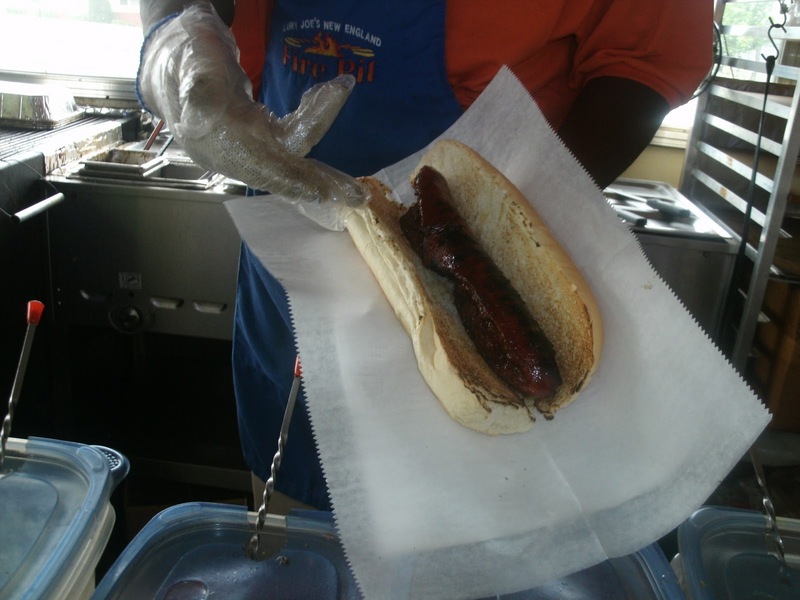 Even next to my big ole head, this hot dog looks enormous! I will surely ruin my dinner. It was absolutely scrumptious! The Hickory Pineapple Barbecue Sauce combined with the smoked dog was divine. If the hot dog wasn’t so GD big, I’d have ordered another. You must go to Bellingham and EAT THIS HOT DOG! I haven’t eaten at Speed’s since the nineties and this dog is better than anything I ever remember eating there (no disrespect intended-Speed obviously taught an eager apprentice well). The Hotdogman gives Larry Joe’s New England Fire Pit TWO THUMBS WAY UP!!! I just hope Mrs. Hotdogman doesn’t get too mad when I tell her I just want a stick of celery and a cracker for supper. 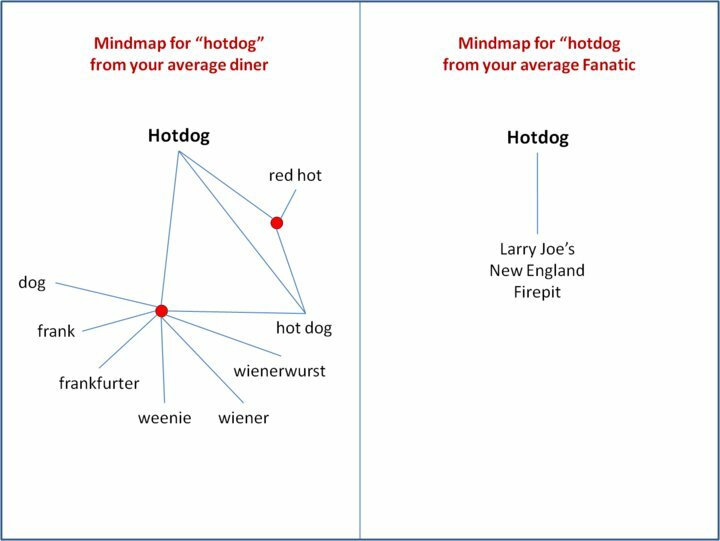 Here’s a flow chart explaining the hot dog eater’s mind map from Larry Joe’s Facebook Fan page. His fan page has a worldwide following- the guy who created it is from Thailand fercryinoutloud! I'm living in Thailand, not Vietnam fercryinoutloud. Still, nice write-up on my buddy Larry Joe. Welcome to the Fanatics! Oh well, he said Viet Nam, but I might not have heard him correctly through my chattering teeth! 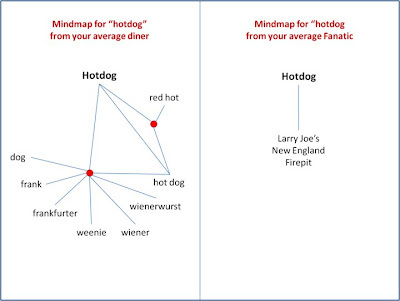 © hotdogstories.com. All rights reserved.